With most offshore wells in Brazil located between 30 and 300 km from the coast, communication with offshore assets has not always been straightforward or reliable. Some operators and service providers still use traditional maritime VSAT services for coverage offshore Brazil, yet the introduction of Microwave radio has led to a much better level of quality and reliability in high-bandwidth voice and data communications. Claudio Paschoa, Maritime Reporter’s correspondent in Brazil had an interesting conversation with Arild Fotland, head of Ceragon’s Oil and Gas Division, about the advantages of Microwave radio communications for offshore operations in Brazil. Fotland joined Ceragon in 1978 and has been stationed all over the world. Since 2010 he has been dealing with introducing Ceragon’s communication systems in Brazil and Argentina. Ceragon has been supplying communication equipment to the offshore industry in the Norwegian continental shelf since the 1976, having delivered more than 200 microwave links in the North Sea. Ceragon is also the sole provider of stabilized antenna systems for microwave radio (4 to 18GHz), with safety certifications to deliver reliable, high-capacity offshore links, which can withstand fading, harsh weather conditions and vessel movements. Ceragon has its knowledge center in Bergen, Norway, where it has developed radio transceivers with a special coating to withstand offshore operations and also where it developed its Pointlink (Point to Point) and Point to Multipoint solutions. “Ceragon’s microwave solutions deliver dependable high-bandwidth with low latency, enabling so-called integrated operations, Video and Data for crew “infotainment”. This is of particular value since to attract quality workers in any given area offshore it is necessary to enable the crew to stay in touch with family/office, as well as offer entertainment during off times, including social media interactivity,” said Arild. In Brazil Ceragon has its offices in the cities of São Paulo and Rio de Janeiro, offering sales and after-sales services, along with technicians dedicated to installing and maintaining their range of equipment. 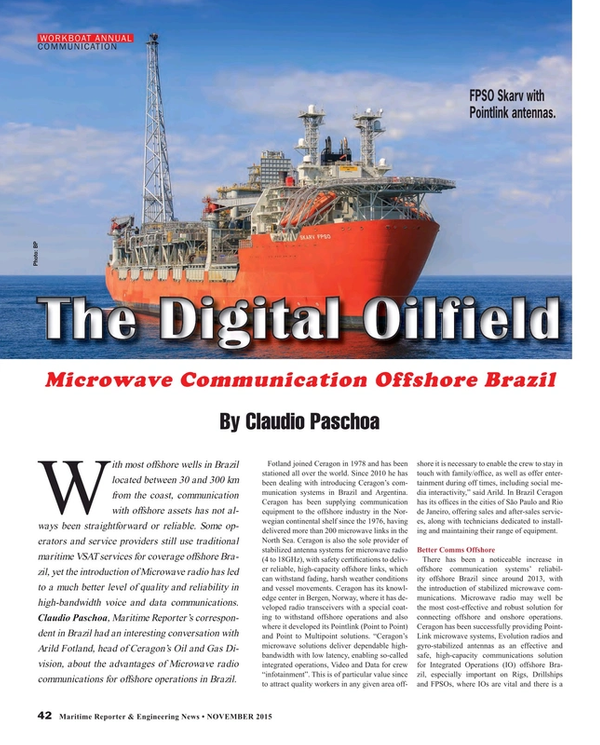 There has been a noticeable increase in offshore communication systems’ reliability offshore Brazil since around 2013, with the introduction of stabilized microwave communications. Microwave radio may well be the most cost-effective and robust solution for connecting offshore and onshore operations. Ceragon has been successfully providing PointLink microwave systems, Evolution radios and gyro-stabilized antennas as an effective and safe, high-capacity communications solution for Integrated Operations (IO) offshore Brazil, especially important on Rigs, Drillships and FPSOs, where IOs are vital and there is a potential risk of gas leaks. Ceragon has been closely working with Norwegian operator Statoil since the 1970s and it has continued this partnership in Brazil. “One of our great accomplishments in Brazil has been the installation of a 176 km link from the top of the 2,257 meter Pico da Caledônia mountain near the city of Nova Friburgo in the state of Rio de Janeiro, around 90km inland, linking Statoil’s Peregrino field, located around 85 km offshore in the Campos Basin. It was a real challenge to place the equipment on top of the mountain, where access was very difficult, as it is located within a National Park and required special logistics considerations. It is probably one of the longest links in the world,” said Arild. Ceragon considers Petrobras an important customer for its aspirations in Brazil, with the national operator being by far the biggest contractor in the Brazilian oil and gas market. “We have delivered many stabilized systems to Petrobras, and our systems are used in many of Petrobras’ major projects, where we have installed stabilized antennas from 0.6 to 1.8 meters in diameter and even a 3m diameter antenna. These are quite big in terms of stabilized solutions of up to 1 Gb. Some of the challenges we have in Brazil are related to the distances involved. In some case we even use fiber optics as a support, by using an already installed fiber point at sea to distribute high-bandwidth signals between remote offshore assets and shore bases,” said Arild. In Brazil, as in other locations in Latin America and around the globe, Ceragon offers turnkey offshore solutions, including field surveys, performance calculations, frequency planning, installation, testing and commissioning, along with after-sales services and Service Level Agreements. Vessel movement is a challenge to any communications system. Rigs, FPSOs, OSVs, Pipelayers and Drillships all require reliable, high-speed data and voice communications, in some cases with all areas of the offshore operation linked continuously to onshore offices, which increasingly have control over critical offshore systems. Reliable communication is also vital for planning and conducting systems shutdown and even vessel evacuation. An FPSO for example may weathervane, or swing on its mooring with wind, wave and tide action, with wind and waves also causing significant pitch, roll, and heave movement. “In order to secure dependable communication links to shore, the antennas of these vessels need to be able to adjust to the ships movements in order to maintain line-of-sight radio contact. Highly accurate GPS systems are also a key component of the communications system. When vessels rotate the stabilized antennas compensate for this movement in order to maintain 0.2 degree of accuracy. Electrical servo motors, specially adapted to safely work in offshore environments, maintain the antennas aligned and stabilized,” says Arild. The antennas and their stabilization systems are pressurized with air inside a dome, making it impossible for any gas leak to penetrate the equipment. This is a vital safety consideration as it allows communication systems to remain operational even in the event of a severe gas leak. All domed Pointlink systems in Brazil are certified for ATEX Zone 1. Arild believes that Brazil and South America in general have a great potential for microwave communication solutions and he sees integrated operations as one of the market drivers. A number of sensors, such as downhole sensors, radar surveillance of oil spills, video surveillance on the rig and underwater also need high bandwidth communications in order to be viewed and controlled from shore bases. Vsat for example only offers a latency of 500 milliseconds, whereas Pointlink offers less than 5 milliseconds. PointLink provides higher capacity and lower latency connectivity than satellite solutions, while guaranteeing lower deployment cost than fiber optic cable. Its stabilized antennas deployed on FPSOs and rigs, stay in perfect alignment for connection to land-based facilities or to other moving offshore installations. The greatest advantage to IO operations is that PointLink’s reliability and high capacity enable the transition of data from offshore assets to onshore locations while maintaining a “virtual presence” at each of the offshore locations. Another innovation by Ceragon is the concept of “Point to Multipoint”. This is a high-capacity Point to Multipoint (P2MP) solution that delivers up to 200Mbps of aggregated traffic, to support voice, data and high-resolution video applications. The solution offers excellent performance in harsh conditions, and robust near line of sight (nLoS) and non-line of sight (NLoS) performance capabilities. It supports an extensive range of sub 6GHz frequency bands, and is suitable for small cell deployments. It has the capacity to bring “h” band to several locations at once, by dividing sectors between 90 and 120 degrees. Inside these sectors many vessels may interact through the same network, and have communications at the same time, making it a form of offshore cloud. In the Campos and Santos Basins offshore Brazil there are hundreds of vessels and rigs operating at any given time and it is believed that this number will reach thousands by the next decade, which makes Point to Multipoint look to be a vital form of communication for vessels operating within a oil field or even an oil basin. It’s important to remember that large oil field such as the Libra pre-salt field in the Santos Basin has an area of over 1,500 square kilometers and when fully developed will be populated by a number of FPSOs and an even larger number of support vessels and even oil tankers, which will load up with oil from some of the FPSOs offshore and will also need reliable communications. Even with Petrobras’ ongoing crisis, Arild still remains highly optimistic and remarks that this has not affected their orders. The only setbacks have been the slowing down of the ordering processes while Petrobras sets is priorities, however there have been no cancellations and a number of communication systems are to be delivered to the national operator in October. Arild concludes that “Ceragon is the only microwave company that provides a complete end-to-end in house solution that includes a stabilized antenna, meets the ATEX Zone 1&2 requirements, and provides state of the art microwave radio technology (Modem, RFIC). By offering tight integration between all components, Ceragon delivers the best performance across all parameters – capacity, reliability and range. What’s more, Ceragon has extensive expertise in offshore microwave and has established solid relations with leading Oil & Gas companies”. With the continuing growth of the Brazilian oil and gas market, onshore and offshore, robust and reliable communications will see a steady increase in demand over the next decade, with IO offshore assets requiring fail-proof communication systems in order to operate smoothly.